Chemistry is the most central of the sciences. New breakthroughs in fields such as genetics, biochemistry, medicine, forensics, nanotechnology, drug discovery, the environment and next-generation computer hardware are all driven by chemistry. Chemistry is about the substances all around us. It is about elements and compounds and how they react. In fact, we all do chemistry every day! As soon as you wake up in the morning, you start doing chemistry. Chemistry explains why an egg changes when you fry it and why your non-stick pan is non-sticky. Chemistry explains how soap and shampoo make you clean, why you feel tired before coffee and alert after it, and how the petrol in your car gets you to work. Chemistry explains all this and much more, such as how the next generation of fuels can be produced sustainably, how new anticancer drugs might work, and what kinds of molecules are observed in interstellar space. 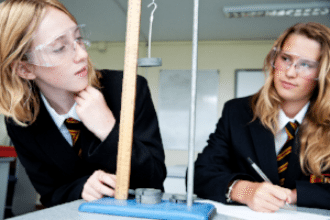 We follow the AQA GCSE Chemistry specification (8462) This qualification is linear which means that students will sit all their exams at the end of the course. At the end of Year 11 the students will sit two examinations. Each examination will be one hour and forty five minutes in length and worth 50% of the final grade. Students can be entered at either Foundation or Higher Tier. As you move up through school, Chemistry gets more exciting. Chemistry explains why so many phenomena take place that we take for granted. Why are fireworks different colours? Why does food go off if not kept in the fridge? Why does wine turn into vinegar if left? How are pharmaceuticals made? Why do nappies absorb so much liquid? All these questions can be answered with Chemistry and at A-Level, the depth of your understanding will increase. Your body is a highly complex chemical factory and because of this, A-Level Chemistry has become a prerequisite for Medicine, Dentistry and Veterinary Science degrees. They not only require you to have a good understanding of chemical principles but will also value the practical and analytical skills that you will acquire during the course. At Formby High School we follow the AQA syllabus. This covers topics involving organic, inorganic and physical chemistry. Some of these will build upon your GCSE knowledge (eg atomic structure) whereas other topics (eg nmr spectroscopy) will be completely new. Chemistry is a practical subject and discoveries are made by asking questions and performing experiments to provide evidence to help answer those questions. You will be required to complete at least 12 practicals outlined in the syllabus in order to obtain the Practical Skills Endorsement required for many degree courses. Knowledge of these practicals is also required for the exam. Some of the Y12 cohort will be able to put those skills into practice at the Merseyside Young Analyst Competition at Liverpool University. A-Level Chemistry is a demanding subject but the challenge is very rewarding and it will enable you to develop a multitude of skills that are transferable to many university and career paths.